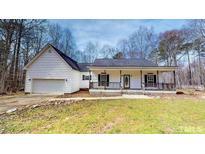 Below you can view all the homes for sale in the Southwick Farms subdivision located in Clayton North Carolina. Listings in Southwick Farms are updated daily from data we receive from the Raleigh multiple listing service. To learn more about any of these homes or to receive custom notifications when a new property is listed for sale in Southwick Farms, give us a call at 919-759-5792. Family Room w/ Vaulted Ceiling & Gas Log Fireplace* Bright Kitchen w/ White Appliances & Breakfast Bar* Sunny Breakfast Nook* Master Suite w/ Walk in Closet & Soaking Tub + Separate Shower* Laundry Room* Attached 2 Car Garage* Rear overlooks Wooded Back Yard & Stream in Back* Close to NC 42 & Flowers Plantation* Convenient to Shopping (Harris Teeter) & Great Schools* MLS#2241875. 1768. Great Outdoor Living Space on over an Acre Lot~Extensive Hardwoods~2 Story with Entry Foyer~Formal Dining~Large Family Room w/Fireplace is Open to Kitchen w/Island, Lots of Cabinets & Breakfast Nook w/Bay Window~Uptairs Master Suite convenient to Secondary Bedrooms plus Huge Bonus~Tankless Hot Water Heater~Multi Level Deck w/Hot Tub overlooking Wooded Lot MLS#2241139. 1197. This home is part of the Southwick Farm Homeowners Association, Inc. MLS#2235316. 4823.